Don’t Buy – DIY! 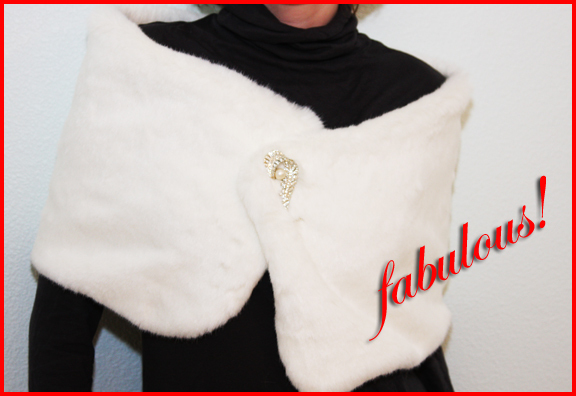 A Fabulously Faux Fur Wrap. I Die. CUT OUT THE FABRIC PIECES: 1.Cut the faux fur. First, though, a tip about cutting any kind of fur, both real & fake: never ever use scissors, or cut from the front (fur) side. Why not? Because you’ll chop right through the fur itself, giving it a weird-looking “haircut” that will make your finished piece look anything but. (Nobody, not even a fur stole, wants to wear a fur mullet. 😉 To cut like a pro, turn the fur over so the underside is facing upward; this is also the time to make sure the nap is laying down (ie. all the fur hairs are pointing down toward the bottom of your stole). Then use the box cutter or razor blade to delicately cut out a rectangle that is at least 12″ wide and 45″ long. By making it 10-15″ longer, you can wrap your stole scrunchie-style around your neck, belt it, or even rock it halter-style vest, cinched together with a fabulous statement belt. 2. Use the box cutter or razor to round off the corners. 3. 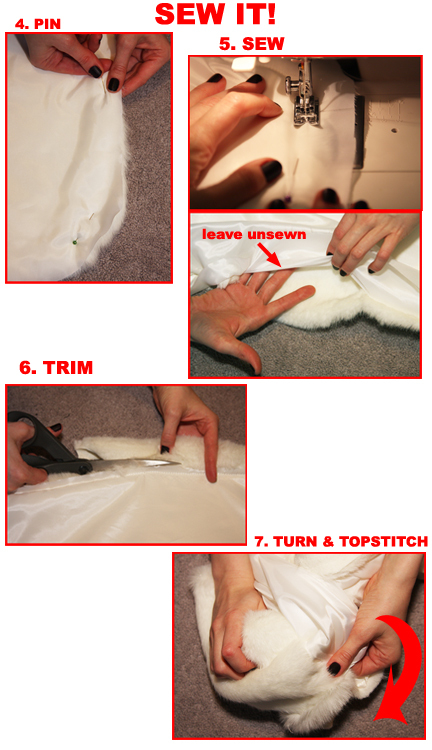 Cut the lining: The cut-fur piece will act as your template when you cut out the satin lining. First place the cut-fur piece onto the satin, fur side down against the back side of the satin. Then carefully cut out the satin lining, taking care to not accidentally trim off any of the fur. 4. Place fur and lining right-sides together (ie. fur side next to the shiny side of the satin), and match up the corners. Pin together. Tip: Satin is slippery when you sew it, so be sure to pin in more places than you think you will need…you can’t overpin! Optional: Add a ribbon-tie using a 12″ piece of ribbon attached to each side of the faux fur, the end of each ribbon piece sandwiched between the lining and the fur. (The long end of the ribbon needs to sit inside the pinned stole pieces.) Pin the ends of the ribbon down to the edges. 5. Sew the fur to the lining, Starting about 3/8″ to 1/2″ in from the edge (your seam allowance), sew the fur to the lining – but not all the way around. Along the bottom, leave about 6″ unsewn. 6. Around the sewn edge, trim away the excess fur. 7. To turn the piece right side out, pull it through the 6″ gap you left unsewn (in Step 5). Optional: If you added a ribbon tie (Step 4), the ribbons will now be on the outside of your stole and serve as closure ties. 8. 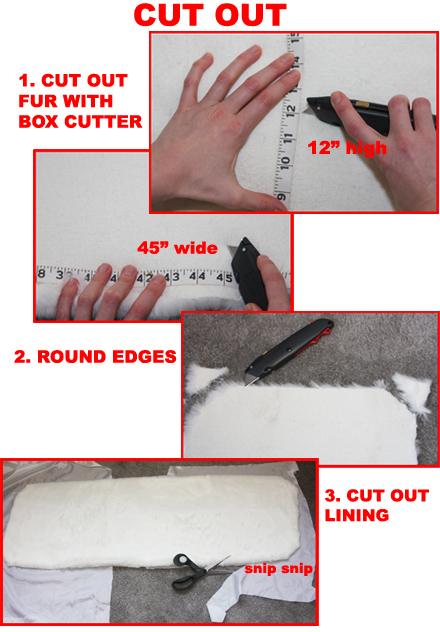 Finish the remaining 6″ unsewn edge by gently tucking the excess 3/8″-1/2″ faux fur and the lining fabric into the hole. Close the hole by topstitching as close to the finished edge as you can. 9. Use a skewer, pencil, or knitting needle to pick the fur hairs out of the edge seams. 10. Try on the stole and decide where you want to place the closure. Mark it with a pin. Optional: Decorate the front with a large, eye-catching brooch. 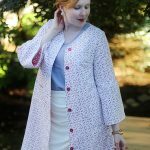 For a “I’m headed to the opera” look, wear your stole draped glamorously around your shoulders; to look more Russian-Anastasia, scrunch up closer to your neck. Mix it up with other faux furs in gray, leopard, or even multicolored – PreFurs.com sells high quality faux fur yardage, while Cornelia James and Charly Calder both sell chic finished items – and enjoy a fashionable walk on the wild side. And yes, you look bananas in it! Have fun any way you try your flirt with the faux! It does look very chic. 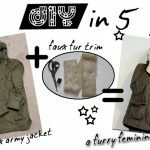 Thanks for the tutorial and the tips on cutting faux fur – I had never heard or thought not to use scissors.